If you want to know the truth, I am more than a little embarrassed at how hard this week’s Power Thought has been for me. I actually found myself thinking, “is it time for a new power thought yet?” Nope, I havet today and tomorrow still with Power Thought #10: I live in the moment and enjoy each moment. My goodness that has been a challenging thought for me. Apparently, I need lots of practice living in the present and enjoying each moment. I do not dwell on the past, but I do have a tendecy to focus a lot on the future, and I don’t have a lot of balance in my life. I do my work. Then, we get a free moment, I feel lost trying to figure out what to do with it. Sunday night, I decided on a whim to make homemade potato soup and get into the fancy sausage, cheese and cracker set we got for Christmas. Yum–it was something different and my husband and I really enjoyed the meal. One day this week, after class, a student stopped me to tell me that I am doing a great job teaching, and that I motivate him and make him want to come to class. Those things don’t happen very often–took my breath away. Maybe the best moment of all was coming home and finding out that my husband had gotten us peeps (baby chickens)! I am enjoying them so much. While I am looking forward to fresh eggs, I look forward to picking up the babies, thinking up chicken names (Chicken-Lickin,’ Chicken Biscuit, Chicken Little, Crunchy Chicken, etc. ), and watchign their feathers come in. So, I am not sure what’s next. I am sad that this Power Thought was so hard for me. When I really think about it, it might be that in order to really enjoy the moment, it’s necessary to let go of the future–trust God with it. I have to let go of life, stop trying to fix everything, and just be. In this light, maybe my issue isn’t an enjoying life difficulty so much as it is a trusting God difficulty. I tried to take pictures of the peeps, but I am having technical difficulties. I hope I can post some pictures of them soon. Speaking of soon, I have another day and a half to really focus on living in the present and enjoying each moment. Oh, God, renew my mind, and help me to enjoy the abundant life you desire for me! Yesterday, while I was waiting for an appointment at the doctor’s office, I meditated on this verse, which is part of the “Power Pack” of scriptures to go with the power thought, “I can do whatever I need to do in life through Christ.” Philippians 4:13 in other versions had become so familiar to me that I never really took the promise to heart as I should have. I memorized the scripture years ago, as “I can do all things through Christ who gives me strength.” As I read over the Amplified text, I zeroed in on ready for anything and equal to anything. Wow! I imagined someone speaking those words to me: “You are ready for anything and equal to anything in Christ.” In the past, I have often used the excuse, “I’m not ready for that,” or “That’s too hard for me.” Well, here’s the verse to refute that type of thinking. I am ready for anything and equal to anything. This verse also has important meaning to me because as I was writing in my journal and thinking about my plans for the day, I realized that I want to as much as it is within my control, always say “yes” when my husband or another family member asks me to do something, issues an invitation, or just wants me to listen. I also have a rule that I always answer my cell phone whenever a family member calls. If it’s not possible for some reason, I call back as soon as I can. I want to be ready and equal to anything they might need or request. My husband asked me to go with him yesterday afternoon to look at some cattle he is considering buying, and I told him I would let him know. I was in another town for my doctor’s appointment, and I wanted to browse the January sales, and do some work of my own since classes start next week. I decided that everything would wait except for the opportunity to spend time with my husband. 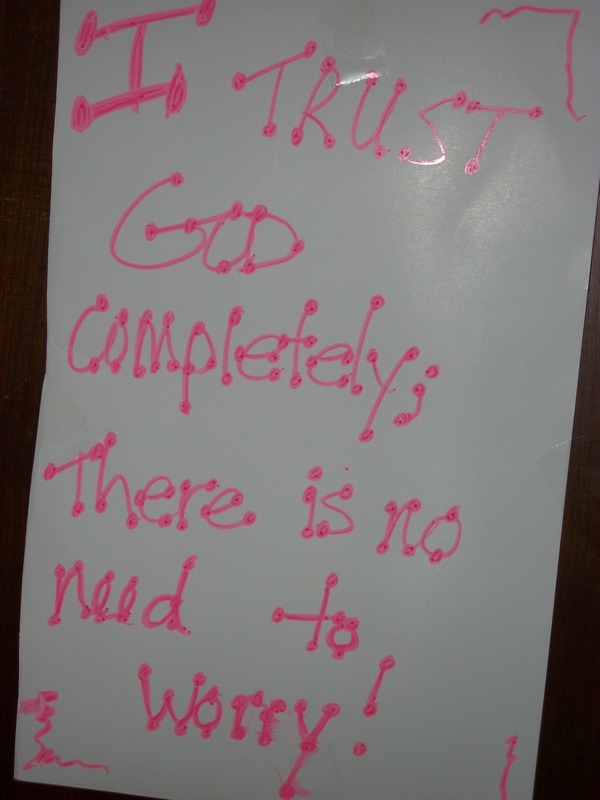 I am trusting God that the other things will also be completed in due time. I had a similar experience this morning. My “to do” list for today was beginning to reach into Thursday and Friday, and I had no sense of where or how to start on the long list of tasks today. 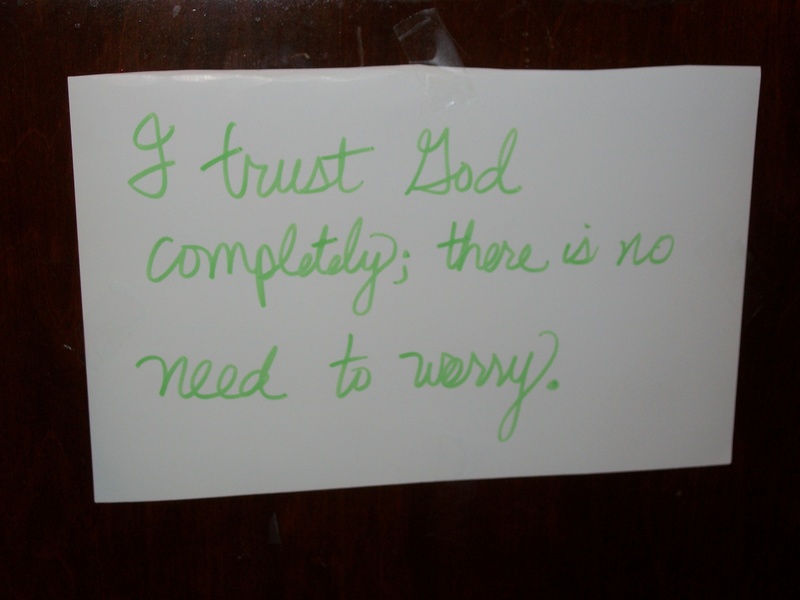 I went to bed, trusting God to show me when I woke up. This morning, I remembered that my mother-in-law needed a ride to work so that she could pick up her car which she had worked on, without having two vehicles in town. My husband told me he could take her to get it Thursday or Friday, and I didn’t say anything. While I was drinking my coffee, the Lord brought this to mind, and I felt compelled to get myself ready and take her to get her car. 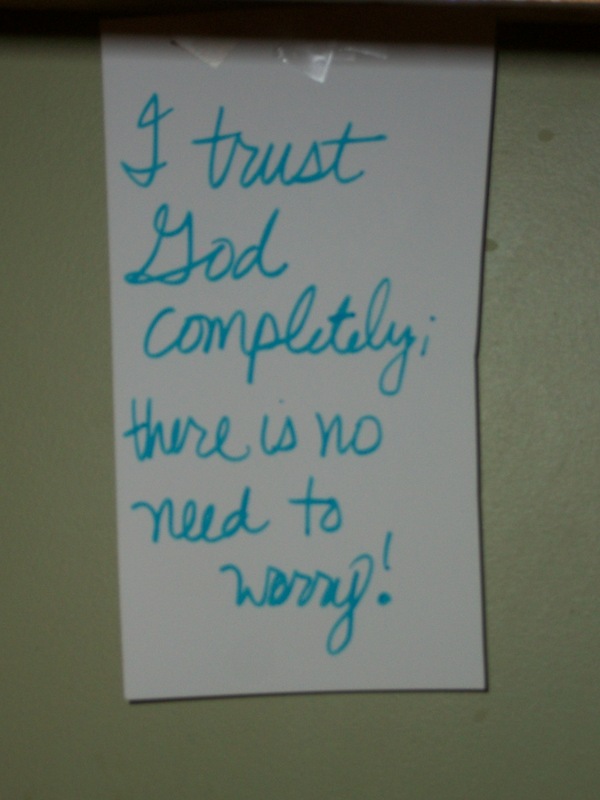 I am trusting God to lead me through the day, even though it means that not everything on my list may get marked off. I would much prefer to do the things on his list.